Don't use AMAZON size chart. Please choose it from our Size Name and Description located in the product page. 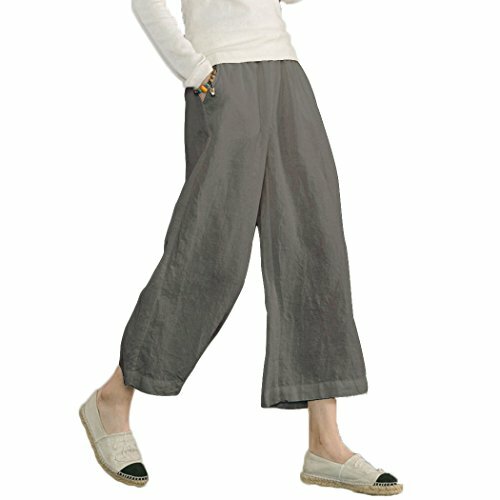 Material: 100%Linen, It is breathable, lightweight, fresh & comfort.Linen Tapered Trousers With Pockets for women,perfect for very hot and humid climates. Drawstring Elatic Waist Makes it is easy to pull on and take off,Two Side Pockets is very useful,low crotch,wide leg cropped pants. Any Queries, Please Feel Free to Contact Ume Store. It is linen fabric, which is nature plant fabric, suitable for the allergic skin too. Pls check the measurement then choose the suitable size for yourself. US 8=TagM--- Waist:26.7"-39.3" Hip:42.5" Length:34.2"
US 12-14=TagXL--- Waist:29.9"-42.5" Hip:45.6" Length:36.6"
US 14-16=Tag2XL--- Waist:32.2"-44.8" Hip:48.0" Length:37.0"
US 18=Tag3XL--- Waist:34.6"-47.2" Hip:51.1" Length:37.4"